Herb and Betty Bazur, long-time supporters and friends of the GCW. We learned last week that a good friend and long-time supporter of the Gainesvills Catholic Worker, Herb Bazur, had passed away. Herb died on August 20; he was 88 years old. I have known Herb and his wife Betty for almost 20 years, first meeting them through my work at Pax Christi USA when I was organizing retreats and gatherings for college students in the 90’s. I first met their granddaughter at one of the PCUSA Young Adult Forum retreats, and soon after met Herb and Betty when this gregarious, mustachioed gentleman wrapped his arms around me at a PCUSA National Conference and thanked me for organizing the retreat his granddaughter had attended. That was my introduction to Herb, and I have enjoyed hundreds of hugs and kisses on my cheek from him ever since. I think everyone who knows Herb would echo this sentiment: He was full of life. Life was just overflowing in him, spilling over the brim and invigorating anyone who was around him. He was kind and funny, generous and caring, affectionate and totally present to you whenever you were with him. He was a successful man who was grateful for all that life had given him and wanting to share whatever he had with whomever needed it. He and Betty have been peace activists and supporters of organizations dedicated to helping people who are impoverished or otherwise marginalized because of injustice. 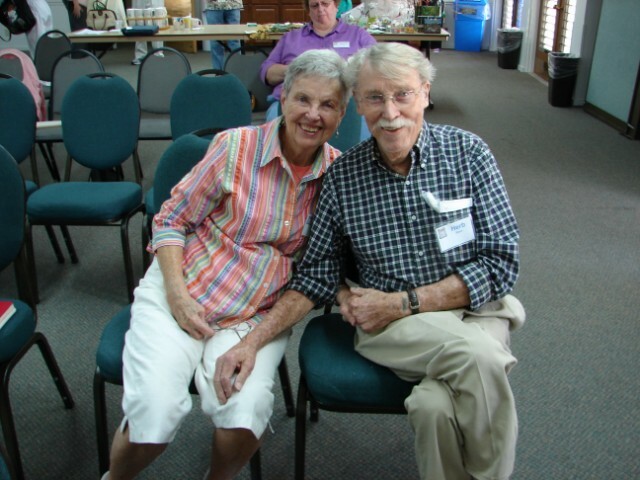 Herb and Betty have been among that small group of GCW supporters who send a check every month to help us do our work. But more important than that monthly check was the note that always accompanied it. Oftentimes it was Herb’s scrawl, usually on the outside of the envelope: “Johnny Z! We love you and miss you!” And inside would be a longer note, from him or from Betty, sharing with us how they were doing, what was happening in their lives, and telling us how much they appreciated us and the work we were doing. Such notes mean so much. If you have a moment today, I encourage you to read Herb’s obituary, written by his family. In it they write, “We will work to keep alive the memory of our charismatic and colorful Herb in many ways. He would encourage us to stop and smell the flowers, love our neighbors, walk with the marginalized, vote with poor people in mind, and spread joy.” Such is his legacy and such was his life. The GCW has benefitted greatly from Herb’s support and kindness. Personally, I know that I am the better for having known him. Our friendship was a great joy. I give thanks for Herb’s life, for Betty and for their family. We love you all. HOUSE NEWS: Let the new semester officially begin! Click here to see an entire list of what is happening this week at the Gainesville Catholic Worker. This week wil be the first full week of our Fall 2012 schedule. As always, we hope you’ll think about joining us this semester in whatever way fits your schedule and lifestyle. We have a lot going on, some big plans to announce in the weeks to come, old and new projects, and new community members! We would be especially excited to have some of you make volunteering or participating at the Green House part of your weekly schedule. Regular gig volunteers are always a huge help! Our general weekly schedule is up on the site now on our About Us page, and the more particular week-to-week schedule (which gets updated each week) can be found here. DOROTHY’S CAFE STARTS THIS WEDNESDAY: We’ll host our first Dorothy’s Farmers’ Market Cafe of the semester this Wednesday, with a slight change in schedule from last year. We’ll be serving between 1-4pm (instead of 12-3pm), prep will start at 10am, and clean-up will be between 3:30-5pm. We’re accommodating some changes in the schedules of our core house members with this so make note that everything starts about an hour later than usual. We need volunteers, especially for this first one as we haven’t a clue what kind of regular crew might form over the next few weeks. If you can make it this Wednesday, drop us a line and let us know or just show up. And if you think you can make a regular commitment for the cafe, excellent! Let us know and we’ll get you on the regular schedule. WORKING DOWN ON THE MICRO-FARM: We’re continuing our partnership with GCW extended community members Jade Allen and Lynn Chacko, helping to work their urban micro-farm just a few blocks from UF. The micro-farm provides produce which is shared with our friends and neighbors at the cafe and through distribution from the GCW. It’s a great opportunity to learn about local, organic farming too! We have a regular weekly workday at the micro-farm on Thursdays, from 8am to 12pm. You can volunteer all morning or for an hour or whatever suits your schedule. Call Jade at 352-275-4661 or 352-337-0817 to get directions and let him know you’re coming. KNITTING IT ALL TOGETHER: Our committed group, the Green House Knitters, will continue to meet this fall on Mondays, from 7:30-9:30pm. This dedicated, boisterous group of women of all ages and stages of life come together to work on personal projects or projects to serve our friends who live on the street (especially when the weather starts to turn cold). You can also join them to knit homemade rugs from recycled t-shirts, one of the GCW’s cottage industries which helps support the work of the house and offers a way for some of our friends who are needing to earn a little money to help support themselves too. We have needles and yarn, and anything else you may need. Crocheters are welcome too! ODDS AND ENDS: We’ll be adding a few more things to the schedule as we get started this semester, so check back regularly. We also have some special plans to observe our 12th anniversary in October. Coming up soon: First Thursday Roundtable in September will feature Kelli sharing her experiences on the Camino this summer; our start-of-the-semester prayer service and potluck to welcome our new house community members in early September (date to be determined); football game Saturdays; and more!